Father Louis Hurst preach a thoughtful sermon at the funeral service of a young man who the church adopted after his mother, a street vendor, died. His home situation was further compounded when fire destroyed all his belongings. I was personally moved by the genuine care demonstrated by the congregation. KPC may not be bursting with an overflow of worshippers on a Sunday morning but their witness to the vendors in Parade and the City as a whole is something that we can be proud of. But here we are at his funeral. And it is a reminder that none of us are immune to death. This creates a level of uncertainty. It would be easy to blame Derrick, say that he did something wrong, which led up to his death and certainly Derrick did not see himself as any saint, he struggled with growing up as a young man in the down town community , he struggled with disappointing those who cared for him, but Derrick was far from being a bad person. O He had the bad habit of waking up late, leaving a mess in the kitchen, failing to tidy up his room, sneaking a smoke now and then, and occasionally losing his temper, especially at football matches,….. but so do many young men and women. And even if he had bad habits he certainly had more than enough good ones to out weigh them. He was generous and kind, always willing to share the little he had. – I never saw him being mean to another person. He was often willing: and helpful…. weather it was baby sitting, running errands or just doing what was asked of him … He hardly ever said no, to a request. But perhaps his greatest qualities were that he was resilient- hetook hardship in his stride, rarely complained, did not hold a grudge never was bitter. And he was gifted. He was musician. and he was a showman …We will always picture him alive, animated and playing his pan with his usual wide grin. Derrick loved his family. His late mother, his sisters and his brothers. But he also found a family here among the members of the Parish Church. In fact much of his life was centered around life and witness withn the church. He would assist in the setting up for worship and events. And though he like many struggled to understand his faith in God and felt at times that he had failed in living as a christian, he would regularly receive the Holy Communion – the body and blood of Christ. Like all families we had our quarrels, there were times when we did not see eye to eye on everything. But He loved and cared for us and we loved and cared for him. Weekly at the Eucharist and he would offer his gifts and talents to the worship. Of God. In fact it was his joy to make an offering of his music. I dont know whether he understood and grasped the fact that he was like the widow who gave her mite, and that he too was offering to his God his all, everything he had to give…..I believe Christ would be well pleased. Bob Marley says “one good thing about Music when it hits you, you feel no pain”. And for Derrick I believe Music was his escape from all the harsh realities of the world he lived in. It became his solace. In his music he could say what he could not say with words, with music he could be eloquent, dream of achieving greatness. “Music and Rhythm always finds their way into the secret places of our souls” – Plato – And in his love for music Derrick found much to comfort him. You often saw him picking out tunes at the key board or on the piano for he quickly learnt to pick out the tunes by ear…and he would memorize the notes. He also learnt to play the drums and the violin, and for a while played with the Jamaica Orchestra for youth. His passion however was for the steel pan . Here Derrick knew he had mastery…. He might have to beg to get a chance to play on the football team, he might worry about the future, have trouble with school work, getting a job, he might worry about his size , or whether he would get the girl but when it came to the pans he knew he was a force to be reckoned with. He was an integral part of the Musical Apostles and Derrick saw himself as the lead player and Mr. McBean’s ( Musical Director) right hand. something the others would not entirely agree with. And it grieved him when the older members of the band dropped out, he tried to get them back. When the new band started he often would offer help to the new members of the band for he dreamed of it rising again. How do we now say goodbye. …for music comes to an end and the sound disappears. And yet any musician worth their salt will tell you that silences and rest are an integral part of making music. The fact that his pan is silenced is by far not the end, the music continues. For what we have come to celebrate today is an empty grave. I draw your attention to John Gospel 20 to the silence of the early morning as a woman arrives at a tomb to visit the one who represented music in her life. As she came to our Lord’s grave she saw the stone rolled back, and an empty tomb. For Mary and the disciples which came after, at first there is shock, confusion….. and as she stood crying she heard that voice which had so often spoken to her. It took her some time but she soon recognized it as that of Her shepherd Jesus There is much in the gospels about Jesus using his voice. It can heal the sick, tell wonderful stories which can teach us, wake the dead, cause soldiers to fall back in terror. It was this same voice which Mary heard, which the disciples of Emmaus recognized as there hearts burned within as he spoke. “Nothing not even death can separate us from Gods love. Revealed in Jesus Christ our Lord”. 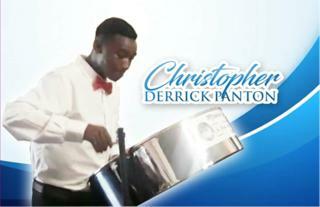 One of our young steel band members asked me whether Derrick knew at that moment that he was dying? Maybe the question should be did Derrick here his shepherds voice, calling him to come. One of the hymns the steel pan often played at Mass is Father Richard Ho Lungs hymns Father lord we offer you our daily life……. father take this love I offer you…. But the refrain goes on to say : and I know that we will rise again, again and I know we will die and rise again. for I know he is the living yeast of life and I know that he will rise again. That is what we celebrate today -an empty grave. The fact that Christ made a promise that if we believe and trust in him, call upon him he will raise us up with him. For salvation is not earned by you mastering the art of faith but is a matter of grace. We all have our memories, which we bring today. For if we believe that Christ offers us the gift of eternal life by grace then the music we make on earth – is only in in anticipation of music which is never ending, that flows out forever . The music of worship around the throne of God the sound of praise the eternal alleluia. Rest in Peace brother Derrick and keep playing your music.